Q. How do I troubleshoot my sync setup? You are here: Home / LifeTopix / Common Questions / Q. How do I troubleshoot my sync setup? 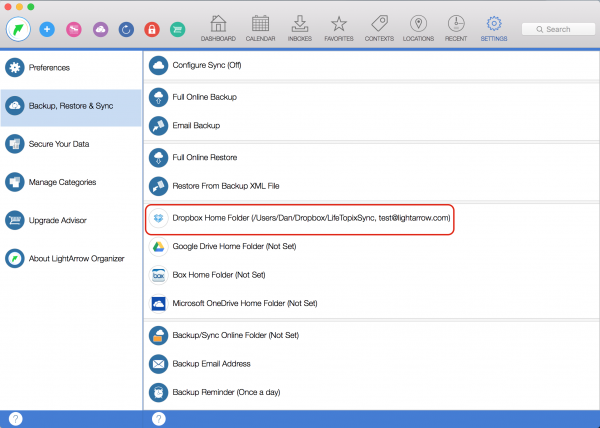 This help page goes over how to troubleshoot if sync is setup correctly between our app on Mac and iOS. 1. Sometimes our users think sync is setup because the calendar items show up for both the iOS and Mac app. However, unless you see tasks, appointments, contacts, notes, etc. 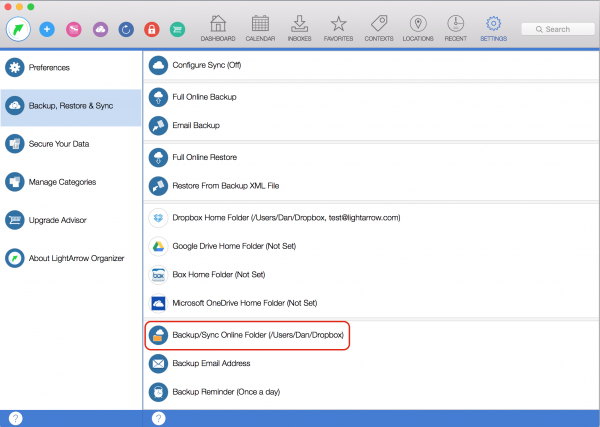 show up on both devices, sync is not setup correctly. 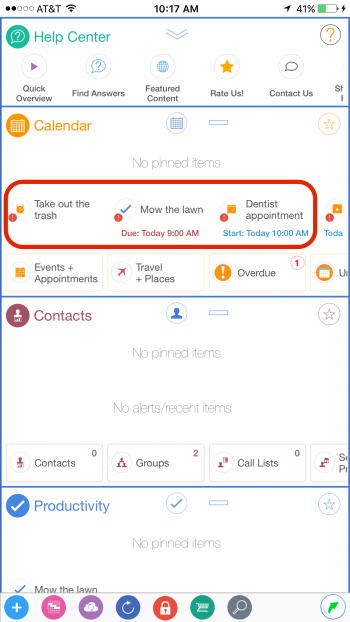 Here is a screenshot of the LightArrow Organizer for iOS and shows a reminder (“Take out the trash”), task (“Mow the lawn”), and appointment (“Dentist appointment”) that was created using the app. 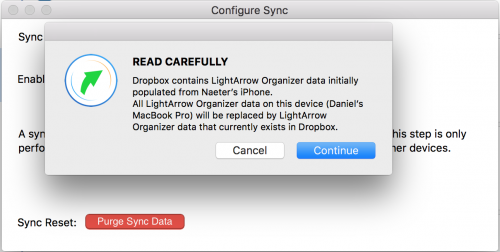 Next, for the LightArrow Organizer for Mac should not be like the following screenshot. 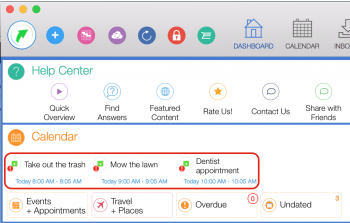 This screenshot only shows calendar items on the LightArrow Organizer for Mac. This means sync is not setup correctly. 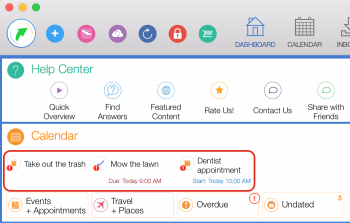 This is a screenshot of the LightArrow Organizer for Mac, and shows the task, appointment, and reminder items. This means sync is setup correctly. 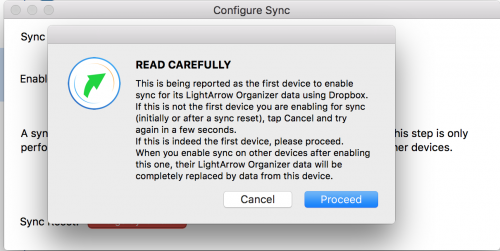 Also, go to the Recent (Recently Updated) view on each device to make sure the same data shows up – that is the best way to determine that sync is set up properly. 3. 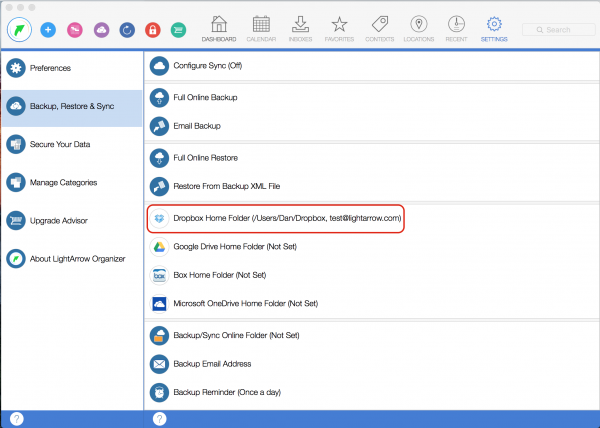 Make sure, when you enable sync from the second or third device, that the popup says Dropbox already contains data from <your_first_device>. If on the 2nd/3rd device it says “This is being reported the first device…” – do not proceed. Check your paths again. Only the very first device you enable should report itself as the first device.